While many of his classmates were ready to leave college for the workforce after graduation, Dave Berque wanted to pursue academia as a career because of his undergraduate experience at a liberal arts college, an experience that he looks upon positively. In 1992, DePauw University hired Berque, who had just graduated with a Ph.D. in computer science four months earlier, to be an associate professor of computer science. “I went to a small college and I really appreciated what the faculty and staff at the University did for me, which motivated me to pursue graduate school and work at a small liberal arts college,” Berque said of his academic background. Berque has since worked in various roles at DePauw to give students an academic experience similar to what he experienced as a student. During the course of his twenty-seven years at DePauw, Berque has taught courses in computer science, guided students on research projects, and served in several different administrative roles. Berque currently serves two roles as Associate Vice President of Student Academic Life and Dean of Academic Life as well as teaching computer science courses as well. Although Berque’s background is diverse, his work shares a common theme of improving the academic experience of the students. Berque has faced many challenges during his time at DePauw thus far, and starting July 1st, Berque will be faced with his greatest challenge yet: serving as Interim Vice President for Academic Affairs for the 2019-2020 school year. Current VP for Academic Affairs Anne Harris announced in December that she will be leaving her role at the end of the 2018-2019 school year after being appointed to the same position at Grinnell College. “The President was looking for someone internally to help out at the time, and since I have worked so closely with Anne, I agreed to help. I am looking forward to the challenge,” Berque said. 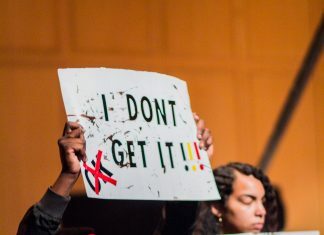 However, Berque also stated that he will not be considered for the permanent role of VP for Academic Affairs, and he plans to return to his roles in faculty after the 2019-2020 school year. As VP of Academic Affairs, Berque plans on continuing the work he has done with Harris, and maintaining a lot of the policies that Harris implemented during her time as VP.